The Alabama Waterdog is a rare species of gilded salamander that is found exclusively in the Black Warrior River drainage system, Alabama. Very little is known about the Alabama Waterdog’s as they are very rare and almost completely hidden during the summer months. The Alabama Waterdog’s are currently classed as endangered due to habitat loss and pollution of the local rivers and streams. The Alabama Waterdog is found in the streams of the Black Warrior River basin and tend to inhabit all but the smaller streams as its crucial to their behavior that there are sufficient places to hide such as tree tucks, rocks and ledges. Although the Alabama Waterdog’s spend most of their time on the bottom of these streams, breeding and nesting are dependent of sufficient leaf beds and that’s what keeps these unique salamanders restricted to the local streams. The Alabama Waterdog’s are medium sized among other waterdogs and like other waterdogs they are completely aquatic and have gills which they depend on throughout their life. Most waterdogs look very similar and the Alabama Waterdog’s are no different, sporting features such as those tell-tale external gills and a long flat shape. Generally the Alabama Waterdog’s are brown or close to black in color which helps with camouflage and its believed that the flat shape of the waterdogs has most likely been adapted to keep well hidden. The color of the Alabama Waterdog’s can vary and some can even have a spotted pattern which is usually lighter than the dark brown coloration commonly associated with them. The males can be easily identified by swollen glands near the reproductive organs which hang down and are easy to spot. On occasion the Alabama Waterdog’s can develop stripes in their juvenile years which will carry through into adulthood, though this is the rarest pattern and doesn’t occur often. The Alabama Waterdog’s are thought to go into long periods of inactivity throughout the summer months, similar to hibernation but caused by high temperatures. Throughout the winter the Alabama Waterdog’s are fully active with the breeding season believed to start around December. 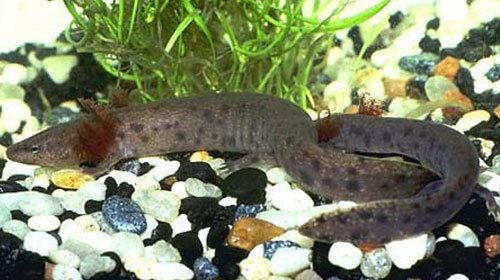 After successful mating the female Alabama Waterdog will deposit eggs in crevices of leaf beds which will then hatch around spring or early summer. The young will reach sexual maturity around 5 years of age. 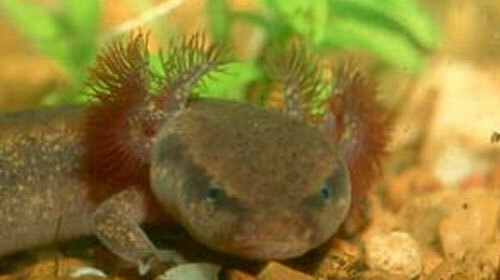 The Alabama Waterdog’s are nocturnal and the worse the weather the happier they are to be active. The preferred diet of the Alabama Waterdog is that of small fish, worms and snails, feeding whenever the opportunity presents itself. You have everything i need thanks, you just saved my science grade. YOU rock! !